The series production of the Eurofighter Typhoon is underway, and the aircraft is being procured under three separate contracts (referred to as "tranches"), each for aircraft with generally improved capabilities. The aircraft has entered service with the British Royal Air Force, the German Luftwaffe, the Italian Aeronautica Militare, the Spanish Air Force and the Austrian Air Force. Saudi Arabia has signed a £4.43 billion (approx. €6.4 billion c. 2007, $9.5 billion) contract for 72 aircraft. Opening the box I was surprised to see this kit engineered like their inexpensive $10 kit line. 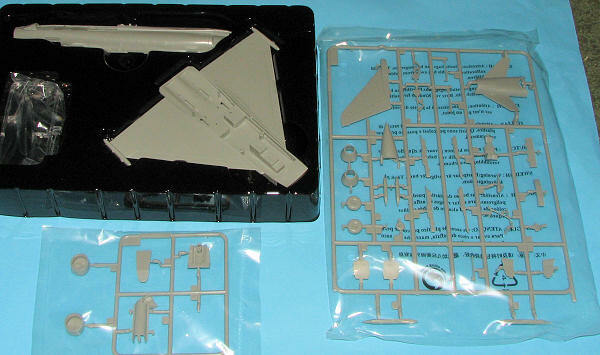 There was a full wing and lower fuselage with a complete upper fuselage and one-piece canopy in the usual black container one finds with their low-buck line. Equally odd as it is priced at the lower echelon of their 'normal' kits in the $25.00 MSRP range. Once over that, I looked at the molding. It is typical of Hobby Boss in that it is really nicely done, though a bit 'softer' in terms of the crispness of the engraved panel lines compared to Hasegawa or Tamiya or even the higher priced Hobby Boss kit. The whole kit is designed for ease of assembly and this includes large pin and socket attachment points. The canards are molded in one piece with the lower nose section. Cockpit is a fair seat, stick and instrument panel in a nicely done tub. Raised detail but most will use the decals and there is no dial detail. It is obvious that there is a two seat version around as there are blanking plates for the aft cockpit area. The only real options available are a raised or lowered speed brake and different pylons/aileron-flap actuators. One that has what appears to be either a bomb mount or chaff dispensers for the inner mount. The outer mount is either plain or has an AMRAAM rail. No weapons are included, which is a bit of a disappointment. 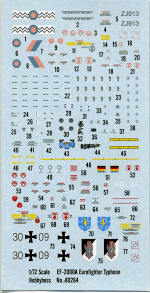 Instructions are typical Hobby Boss with four nicely drawn construction steps, Gunze and generic paint references. Markings are for two aircraft. One German and one British. The exterior paint diagrams are in full color and provide additional paint company references. The decals are nicely done and should provide no problems. For some reason, Hobby Boss frequently omits any unit information and such is the case here. The British plane seems to be with 17 Squadron while the German one is with JG or JBG 35. Both are apparently in an overall grey scheme as I could see no upper/lower demarcation line on the color profiles. 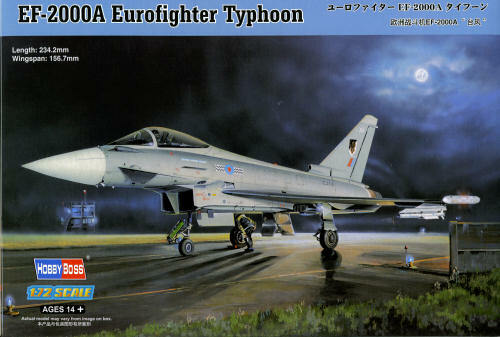 Well, as you can tell, this may not be the kit of choice for those who want the most detailed Typhoon around, but for those who don't look askance at the MSRP, it may be one way to get one of these aircraft on the shelf fairly quickly.